We believe consumers have the right to own, control and profit from their data. Today the Internet is far removed from these aspirations. Consumers have no control, while third parties earn billions with their data. Our mission is to change this imbalance and put consumers back in control. The wysker Platform is a new digital economy where consumers, advertisers and retailers are equals and everybody benefits. The wysker app allows users to discover products faster than ever before while earning wys Tokens for product views. Tokens can then be cashed in for discounts, making them a valuable good. The app also collects high-quality data that consumers can trade directly with advertisers at their discretion, and without giving up control or compromising their privacy. 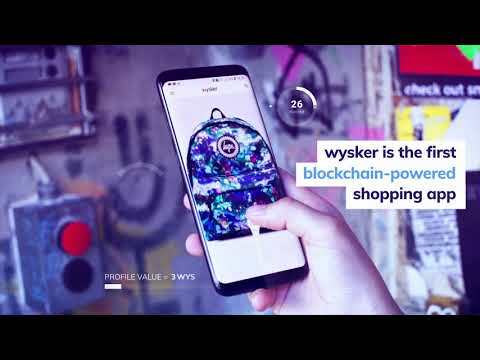 The wysker App pioneers a new type of e-commerce: blockchain-powered mobile shopping. The wys token gives consumers discounts in exchange for product views, advertisers access to customers, and retailers new opportunities to increase their sales. It’s an ERC20 utility token that drives a new generation of digital commerce that runs on the Ethereum blockchain. As the new unit of exchange between consumers, advertisers and retailers, the wys Token is a highly valuable asset. It enables an economy where customer access can be traded for product discounts and it paves the way for the widespread acceptance of cryptocurrencies in digital commerce.